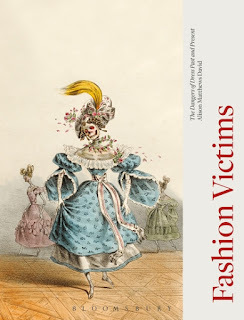 Fashion Victims - The Dangers of Dress Past and Present by Alison Matthews David takes a detailed look at fashion items responsible for death, disease and accidents throughout history. The book is meticulously researched and cleverly broken down into separate chapters, each one denoted by colour coded page edges which make for an attractive hardback edition. Great chapter headings aren't they? I enjoyed learning about dangerous dyes, the deadly mercury used to make hats, hobble skirts, the arsenic contained in green garments in the 1800s, ballerinas who burned to death but refused to change their stage dress and so much more. The research covers both the garment makers (the dyers, dressmakers etc.) and the wearers, exposing the diseases, accidents and deaths attributed to both sides all in the name of fashion. Fashion Victims - The Dangers of Dress Past and Present is an excellent reference for students and academics as well as readers interested in fashion and/or history.